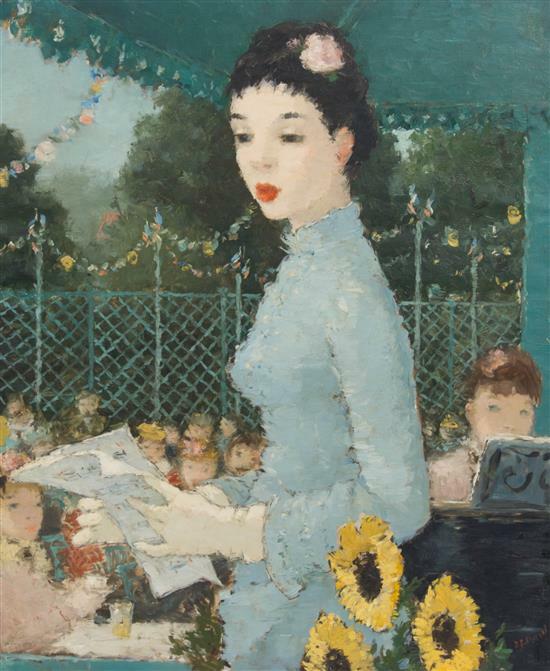 In April 1958, one of the most beautiful exhibitions in Paris was a retrospective showing the work of Dietz Edzard. Rarely has a painter been given such a tribute during his lifetime, and rarely has there been greater sheer beauty concentrated in any one exhibition. The full gamut of this remarkable painter’s talent was shown in florals and figures, scenes from the theater, scenes from cafes and beaches as well as portraits, all characterized by the wonderfully subtle color and glowing light, which are so much a part of Edzard’s special fascination. Glancing through any listing of private and public collections in which Edzard is represented, one finds virtually a “Who’s Who” of discriminating organizations and individuals from many parts of the world. The Art Institute of Chicago, The Toledo Art Museum and the Oklahoma Art Center are among the museums which house Edzard pieces in their permanent collections. Private collectors include Albert Laker, Somerset Maugham, Prince Paul of Yugoslavia, Arthemus Gates, Robert Freund, and Sir Alexander Korda, Mr. I.J. Sondheim, Charles Loeb, the Leigh-Halman Collection of London and many others. Paris was the setting which inspired Dietz Edzard as an artist and surrounded him as his talents developed. One of Edzard’s biographers, Gerd Muehsam, explains: “Edzard’s personality and his style have been molded by varied influences and experiences. Curiously enough, this colorful artist was born in Bremen, a city of leaden skies, of wind and fogs and a flat barren countryside. And equally strange, this sensitive man grew up in the midst of a stern, practical, robust people. It was only after years of wandering that Edzard set his foot upon the ground of the city that has become the epitome of grace, elegance and urbanity. Throughout Edzard’s tremendously successful career as a painter, the common denominator of his work was his love of beauty…beauty of color, of form and of spirit. In any attempt to catalogue his work under a single style of painting, perhaps “romantic impressionist” would be the most descriptive general term one could use. This expression applies equally to his figure and still life subjects. There is combination of exquisiteness and strength in his modeling, a combination of delicacy and pungency in his color which give his paintings their very special flavor. Although his compositions are beautiful at a glance, it is only on closer study that one truly knows and fully appreciates Edzard’s work. He is a painter of great subtlety, using color and the shimmering effect of light contrasted with the ascents of shadow to develop his form. Dietz Edzard is at all times the sensitive, perceptive artist. He brings to canvas the exquisite beauty of flowers with such persuasiveness that one is almost conscious of their fragrance while enjoying their radiance. In the same fashion his figure subjects preserve a scene and mood which are both illusive and provocative in their delicacy. Dietz Edzard’s work represents the quality of painting which holds the interest of critics and collectors and the beauty which appeals to the eye and imagination of all who enjoy fine painting. Among contemporary artists he has established himself in a niche of importance which becomes increasingly secure as years go by.